The best vegan handbags. Do you have a brand in mind that you love? Help me decide! Here are my seven favorite brands at the moment. Handbags are a constantly evolving fashion accessory for the modern woman and man. From clutches to tote bags; from briefcases to backpacks; every few years seems to recycle an old fashion trend. One thing that has been steadily growing stronger though, in all of fashion, is a move towards more sustainable and cruelty-free materials. More people are turning away from low-cost fast-fashion as they learn about the textile waste and labor practices of these companies. More people are turning away from bags made of animal skins (i.e. cow, baby cows, alligators, snakes). They are asking for cruelty-free, animal-friendly options, and a multitude of companies have answered that call to be amazing vegan handbags, work bags, and backpacks. It seems like just yesterday that finding a cute vegan bag was the ultimate challenge for my picky self. Either the limited brands available (that I knew about) looked like they were still using designs from the ’80s, the material could not pass a “can I bring this to work?” test or they were absurdly out of my budget. Fast forward to today and there are an immense array of vegan handbag options to the point where it doesn’t make sense to buy leather anymore unless you’re just buying it for a brand/logo. 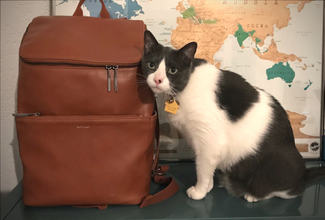 I recently purchased the Brave backpack by Matt and Nat and am so happy with it – high quality, stylish, and fits my criteria for both work and fun. Here is a list of my current 7 favorite cruelty-free, vegan bag companies making stylish products from ethical materials. For price comparison purposes, I’ll include a high-level estimate for the price of a small women’s crossbody purse. Amazing and super stylish vegan bags, right? It always feels 1000% better when a company that I’m supporting (by voting with my money) has a socially-minded, animal-friendly mission. Let me know which brand you love! Did I miss your favorite? Let me know!